Afternoon tea is all about cucumber sandwiches (with the crusts cut off), a warm pot of tea and a nice scone and jam. At least at the Met Bar it’s wrong. Very wrong. Because in honour of Halloween and the Mexican Day of the Dead (on November 2nd), they’ve put together a very different menu to their usual Afternoon De-Light (which, thankfully, doesn’t consist of cucumber sandwiches either). Cocoa nib chocolate cupcakes topped with sugar skull decorations sit next to coffin shaped chilli-chocolate mud pies and traditional Mexican tea cakes filled with dark cherries. And let’s not forget the gorgeously gory-looking vanilla and strawberry cupcakes with pink icing and strawberry sauce bleeding over the edge. If all this sounds scarily unhealthy – fear not – for the Met Bar prides itself on its afternoon tea being the exact opposite. Their famous famous no-bread sandwich pots have been re-vamp-ired for the spooky season with Mexican themed fillings, including a jalapeno foam, crayfish and tequila jelly, and chicken fajita with sour cream and re-fried bean mousse. Each element is a gorgeous, kooky work of art – so it almost seems a shame to take a great big bite out of it. 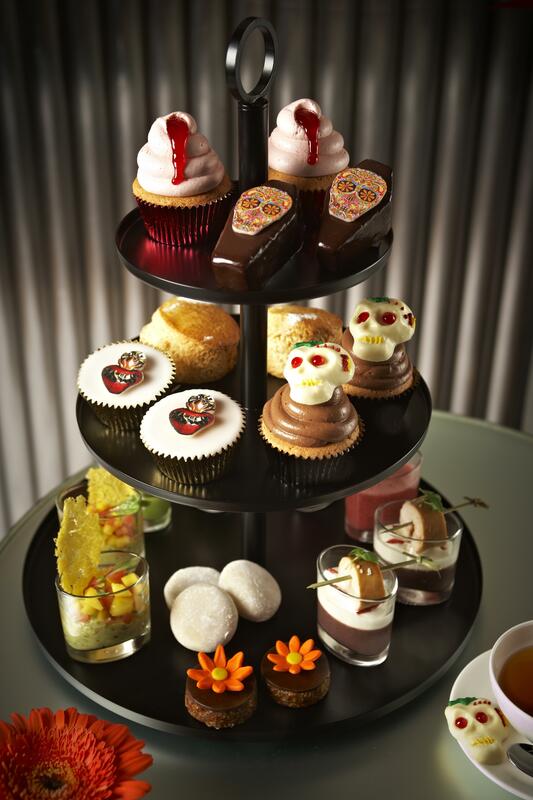 Day of the Dead De-Light afternoon tea is taking place at the Met Bar (19 Old Park Lane) until the 2nd of November. Reservations to be made in advance – 020 7447 4757. £25 per person.